The issue of Geetha Gopi's daughter's ostentatious wedding is likely to be raised in the next executive committee meeting of CPI. CPI legislator Geetha Gopi's daughter's wedding pictures, with the bride decked in gold, are viral. 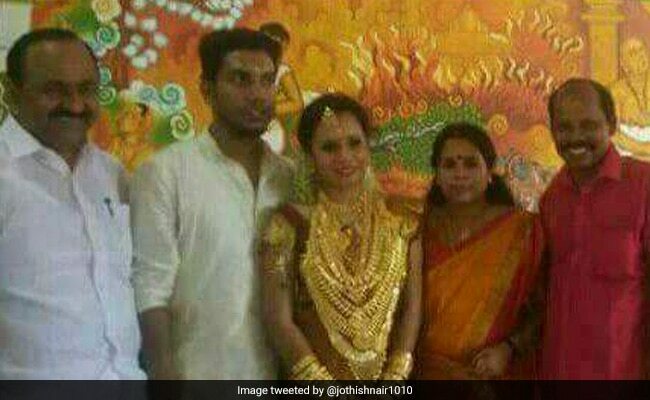 Thiruvananthapuram: The wedding of Kerala CPI legislator Geetha Gopi's daughter drew attention on social media after pictures of the bride decked in gold went viral. The wedding took place in Thrissur on Sunday. The issue has also made its way to the party's discussion board. Ms Gopi is a two-time Communist Party of India (CPI) legislator from Nattika in Thrissur district. The bride's picture went viral in the social media and became a subject of discussion since Ms Gopi's party colleague and former Kerala Agriculture Minister Mullakara Ratnakaran raised the issue of ostentatious weddings in the state assembly in April. Mr Ratnakaran raised the issue through a calling attention motion, demanding that the Pinarayi Vijayan government come out with a new law to prevent ostentatious weddings . The wedding picture shows the bride was covered with gold. According to those in the know of things, some party workers have raised this issue, since it has "dented the party's image, as it speaks one thing and its leaders do the opposite". However, Ms Gopi said the wedding festivities were low-key and what she did "would have been done by any parent according to the accepted norms".